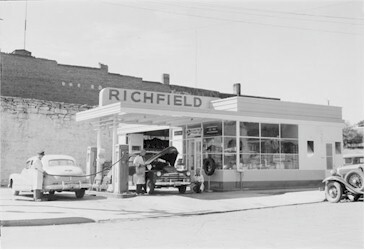 In the 1950s, adjacent to Disneyland in Anaheim, California, Richfield had a "futuristic" service station. 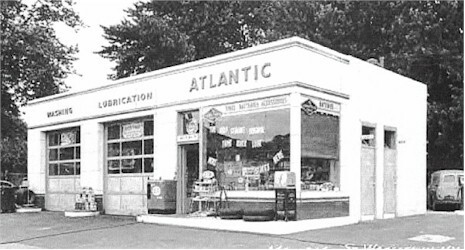 Little did anyone know then that we would be pumping our own fuel and Richfield would merge with Atlantic to create Arco. I'm from the alphabets street,James off Hillside towards Herricks. I went to Notre Dame & then Maria Regina DHS in Uniondale class'74. My Dad's gas station was on Willis Ave.
What a coincidence though huh? I'm also from New Hyde Park (Laurel Drive)... Manor Oaks, NHP Memorial/Sewanhaka HS, grad 1968. You? From that photo? Could be anywhere. Do u know the locarion of that Arco? It looks exactly like my Dad's Cities Service in Williston Pk, LI,NY in the early '60s.